Academy uniform must not be altered in a way that changes the style of the item. Jackets must be worn with the sleeves down. Sleeves on shirts, jumper or jackets must not be rolled up at any time. Only badges issued by the academy may be worn on jackets. Other badges, e.g. charity badges, must only be on outdoor coats or bags. Consequences can/will be issued for any uniform misdemeanor. Only plain black shoes are allowed to be worn with the uniform. No trainers, boots, pumps or canvas/fabric/suede shoes will be allowed. Heels should be no higher that 2.5 cm/1inch. n.b. – If students are not wearing the correct footwear they will be expected to borrow a pair of shoes from the student information desk – the shoes will be treated with a hygienic spray after each use. Failure to wear the shoes provided will result in an exclusion (refusing a reasonable request). Outdoor coats should be fit for purpose and have no large logos. Please note that hoodies, fur, denim and studded leather jackets are not allowed. 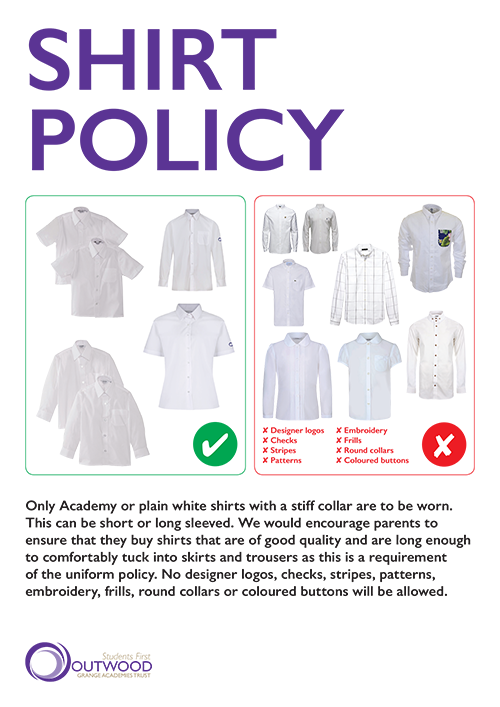 Outdoor coats should be removed at the entrance to the Academy buildings as outdoor wear is not permitted indoors. Students require a school bag which can fit in an Academy planner and A4 workbooks. if you have an Academy tracksuit top you do not have to buy the reversible games top. We strongly advise that students use a hard case to transport their instrument to and from the academy to offer the best possible protection for the instrument. The case must be clearly labelled with the student’s name. Students are responsible for ensuring their instrument is stored safely. The Academy will not be responsible for damage caused due to improper storage or unsuitable protection. Tights must be plain black, opaque (not patterned) and a minimum of 40 denier. Nothing else should be worn on top or under the tights such as additional socks. Nail polish and any type of false nails (including clear gels, acrylics, extensions, Shellac etc) are not allowed. No jewellery is allowed except a wrist watch and a Medic Alert necklace or bracelet. Smart watches are not allowed in the Academy. If any student is thinking about having their ears pierced, or any other piercing, this should be done at the start of the summer holiday, as no student will be allowed to wear earrings or any other jewellery at any time. Noticeable make-up is not allowed. Any make-up must be discreet. The decision as to what qualifies as discreet rests with the Principal and Executive Principal of the individual Academy. False eyelashes are not to be worn. Henna is not allowed. Hairstyles and colour should be sensible. Please check with your child’s Learning Manager before considering any dramatic changes to style or colour. No offensive patterns should be shaved into hairstyles. No scarves or bandanas are allowed (unless for religious reasons). Hair accessories can only be worn in the hair and must be black or Academy purple; hair bobbles cannot be worn on the wrist. Key Stage 4 students studying Food Technology will require a cotton apron. The apron should be non- plastic and non-offensive, and can be purchased from high street stores. All students will need a pen, pencil, ruler and rubber. A scientific calculator; we recommend Casio FX-85, a pair of compasses, a protractor and a dictionary would also be useful. Students who have the older style logo can continue wearing their blazers as they normally would, any replacement will have the new logo. There may be some students who purchase a blazer that has the previous logo on, there is no issue with this, both styles are acceptable. Please be assured that this has been approved by the Outwood Grange Academies Trust Board and you are receiving the correct items when ordering from Trutex or buying from local, approved stockists listed above. If you have any queries please do not hesitate to contact your academy.